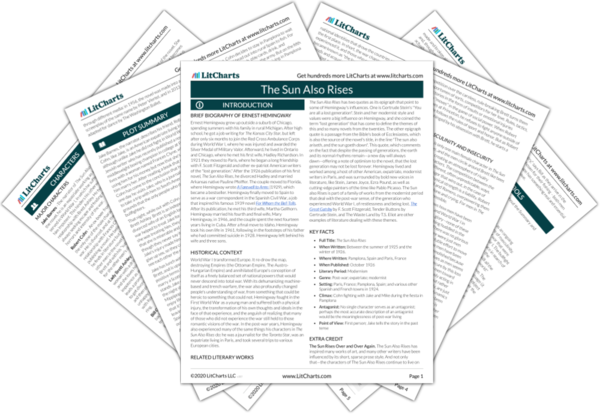 Instant downloads of all 942 LitChart PDFs (including The Sun Also Rises). 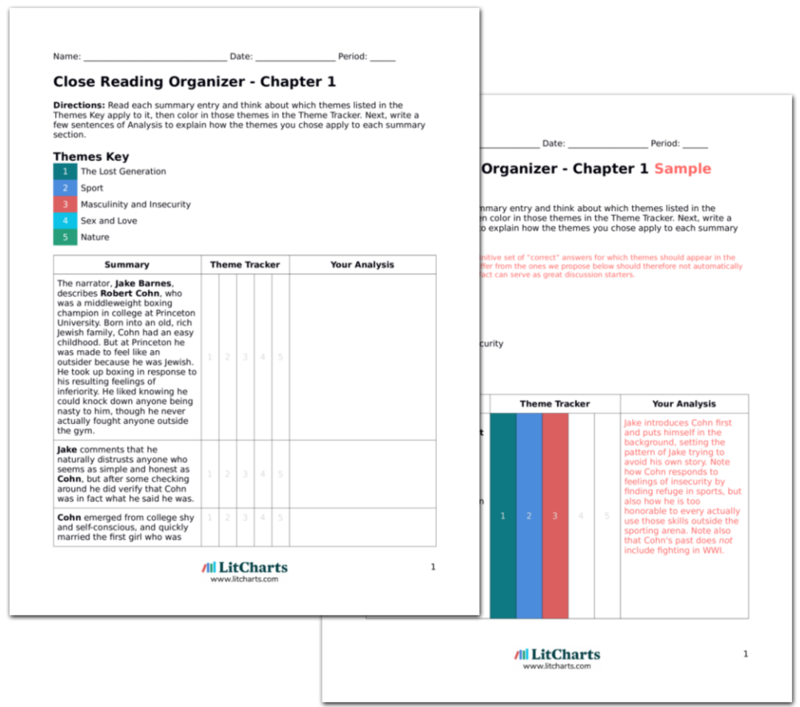 LitCharts assigns a color and icon to each theme in The Sun Also Rises, which you can use to track the themes throughout the work. After Cohn leaves, Jake goes by himself to a café and watches the crowds. He is interested by the poules, a French slang term for prostitutes, and watches one after another walk by. One good-looking poule catches his eye and sits down with him at his table and orders a Pernod, which Jake says is not good for "little girls." The poule asks for the drink herself in French. She asks Jake if he's going on to a party, and he agrees as if it's the only thing to be doing, but she is unsure. She says she doesn't like Paris but that there's nowhere else. Jake watches the scene and avoids his own thoughts. He condescends to the girl but she's the one at home in Paris, speaking the language. They discuss the party not as something that they might actually enjoy, but rather as a something they have to attend. And in fact Jake does have to go, because it's the only way he knows to escape and distract himself from his own thoughts. The girl asks if Jake is going to buy her dinner. When she smiles, Jake sees that she has bad teeth, which puts him off. But they catch a horse-pulled cab and drive past the shops of the Avenue de l'Opera. This "date" is a sham—Jake is looking for amusement, the poule for dinner and money. When she smiles, shows actual emotion, she is no longer pretty. As the cab moves through the streets, the girl uses the opportunity to make sexual overtures to Jake, but he rejects them. She asks if he's sick. He says that he is, and the girl responds that everyone is sick. She tells Jake that her name is Georgette. The girl is a prostitute—she makes an advance because she wants to make money. The reader knows that Jake is not sick, raising the question of why he rejects her advances. At the same time, the sickness describes everything, sadness, injury, and the whole uneasy world of post-WWI society. Georgette dislikes the restaurant they arrive at and Jake remembers how dull poules can be. Georgette cheers up when she sees the food and they start drinking, clinking glasses like a real couple. Georgette cheers up about Jake too, saying it's a shame he got hurt in the "dirty war." Jake says he is so bored that he wouldn't even mind talking about the war, but is interrupted by his friend Braddocks calling out to him. He sees a group of his friends, including Frances and Robert Cohn sitting at another table. Georgette is completely materialistic. At the same time, how different is she from Frances? They both want money, not love, out of relationships. Yet Jake, unlike Cohn, sees through the façade. That Jake is so bored he wouldn't mind talking about the war indicates how much he normally does mind talking about it. And, once again, the social scene manages to distract Jake from actually having to think about the war. 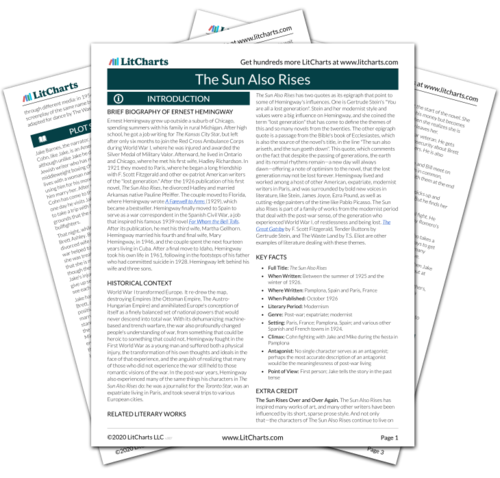 Get the entire The Sun Also Rises LitChart as a printable PDF. Jake's friends ask him to come dancing with them. Jake returns to Georgette and describes his friends to her as "writers and artists," then takes her into the room, introducing her to everybody as his fiancé, Georgette Leblanc, which is the name of a famous singer. Everyone is confused. The group obsessively seeks to live a life of pure leisure. Jake groups them into an identity of "writers and artists" but they don't live up to those identities—they never seem to create anything. In fact the only identity that seems stable is of avoiding identity. The lack of identity in the characters is driven home by Jake's joke, which makes Georgette into someone recognizable. They arrive too early at the dance hall, which is nearly empty, with only the owner and his family inside. The proprietor starts playing the accordion and the group starts dancing. The club starts to fill up and soon becomes hot and sweaty. While Georgette is asked to dance, Jake stands at the club door, feeling the breeze and watching a group of men arrive along with someone he knows: Lady Brett Ashley, a beautiful woman with short hair. The sight of the family that owns the club is a reminder that the characters of the Lost Generation don't really have families. They have only their friends, with whom they avoid discussing anything important. In the dance, the heat and rhythm creates a kind of closeness between people, but it's not something that lasts beyond the night. It's a distraction. Brett's short hair hints at her untraditional femininity—in many ways she acts like a man. The men in Brett's group have spotted Georgette and are talking about dancing with her as if for a dare. These men, who are "supposed to be amusing", annoy Jake. He walks to the club next door to get a drink, but the drink tastes sour and he comes back. Upon his return, Georgette is surrounded by men on the dance floor and Jake knows that they will all take their turn with her. Though never stated explicitly, the novel strongly implies that the men with Brett are gay. That the men annoy Jake so strongly indicates his own masculine insecurity. Meanwhile, the atmosphere is completely unromantic and transactional: Georgette is treated like a poker chip. Jake sits at a table with his friends and meets a novelist called Robert Prentiss. Jake insists on getting Prentiss a drink and when asked about Paris, Jake says that he likes it. He admits he is drunk and loses his temper with the question. Prentiss thinks this is charming. Jake gets up and goes to the dance floor. Frances follows Jake, thinking he is angry, but Jake insists he is sick. Jake says that the "whole show" makes him sick. Male writers in the novel are repeatedly meeting other male writers and masculine competition is renewed, but never resolved. Jake sees that the social scene is empty – the others seem to believe in it, Jake sees through it. At the same time, Jake has been totally unflappable until Brett arrived. Now he is more mercurial. Clearly she affects him. Brett walks over to Jake. As they greet each other, Jake notices Cohn looking at the "damned good-looking" Brett, as if towards the "promised land." Brett jokes with Jake about bringing the poule to the club, while Jake comments on the "fine crowd" that Brett has brought with her. Brett responds that they are men she can safely get drunk around. Cohn then approaches and asks Brett to dance but Brett says it's been promised to Jake. As they dance, Jake scolds Brett for collecting crushes, such as the one Cohn now has on her. In the heat, and amid the accordion music of the bar, Jake admits feeling happy. While the reader realizes how much Brett's presence has affected Jake's mood, he deflects his feelings for her onto the other male characters, reflecting more on Cohn's crush than his own. For her part, Brett plays along with the typical feminine rituals of accepting dances, but her banter with Jake is decisively masculine. It's worth noting how Cohn wanted to travel to a foreign land, and how that language is now fulfilled in Brett as "the promised land," implying Cohn now sees her as the way toward a fully lived life. Brett suggests she and Jake go to a different club. Jake leaves fifty francs in an envelope at the bar for Georgette. Jake and Brett wait quietly at a nearby car until a taxi arrives. When a taxi does arrive, Brett tells Jake to make the cab "drive around." Jake instructs the driver to do so, and then follows Brett into the cab. Once the cab starts to move, Brett confesses that she has been "so miserable." Brett is magnetic, and Jake follows after her. In contrast, Jake pays for Georgette with a sense of duty but no feeling of affection attached. The Lost Generation seem only able to open up when they're moving, even if it's just in a cab. When Brett does open up, it is revealed that even she is deeply unhappy, despite the whole "show" at the club. Parfitt, Georgina. "The Sun Also Rises Chapter 3." LitCharts. LitCharts LLC, 22 Jul 2013. Web. 11 Jan 2019. Parfitt, Georgina. "The Sun Also Rises Chapter 3." LitCharts LLC, July 22, 2013. Retrieved January 11, 2019. https://www.litcharts.com/lit/the-sun-also-rises/chapter-3.